Nothing beautifies walls like an interior wall-light. 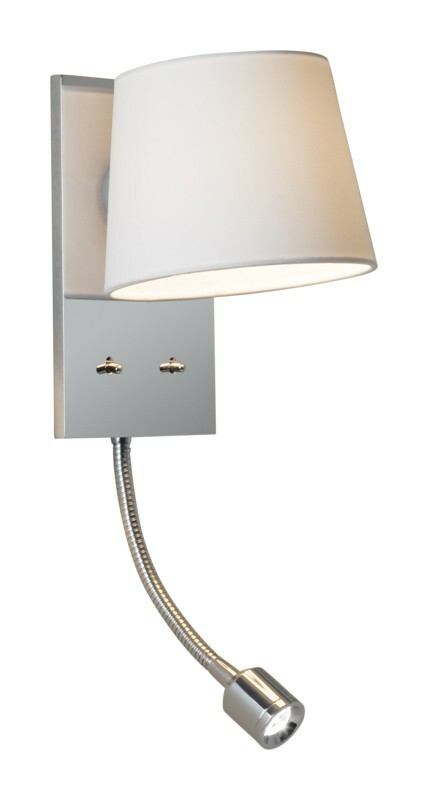 And for those seeking a different contemporary look, this wall-light is for you. Offered with a chrome finish and a white fabric shade, this wall-light is a simple step to giving your interior the modern stylish look that will attract the attention of everyone. Although this wall-light is compact in size it packs the punch of a lamp strong enough to illuminate even the darkest of spaces. It also comes complete with an integrated 1W LED reading light making it ideal for use as a bedside lamp - why not have one on either side of your bed for that coordinated designer look? There is no doubt that this is the decorative lighting piece that will achieve the modern look you so desire.